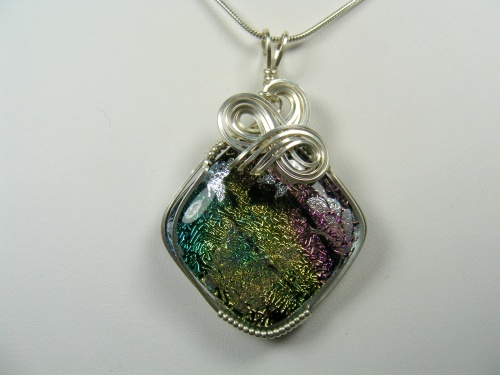 This beautiful handmade dichroic glass pendant has colors of greens, and yellows, blues and pinks. Multi colored yet dramatic and vibrant with its sweet butterflies fluttering on the piece. Piece is enhanced with its beautiful sterling silver curls and, measures 1 3/4" by 1" and comes with a sterling silver snake chain.